This past weekend, it was a bit gloomy outside. I like that feeling of having to turn on the lights in the middle of the day; it’s something different, unique and it gives me the wont to do something different. Jax likes days like this too. Sometimes we take all of the sheets and the blankets and drape them over strategically places chairs, making a long fort. Sometimes we get out the View Master projector and shine the pictures on the wall. Not just any wall, it has to be something “different”, like a hallway or inside the large walk-in closet. It is more fun that way. These days, Jax has outgrown blanket forts and View Master. So mom needs to think of some other excitement for the unusually dark day. After a board game, I decided that he wasn’t too old for cleaning out a closet. After all, it is fall and it is time to be rid of the summer clothes which he will not fit into next year. He agreed to help me by trying on clothes, something kids usually dread. Jax obviously doesn’t grow as quickly as other children, so he has amassed quite a collection of clothes. This year, as I went through his wardrobe, I realized there were a lot of clothes he had outgrown. After he had tried on a few garments, I realized almost all of his clothes were the same size or smaller! How could I not have noticed such a growth spurt over the past year? The pile of clothes for quilting was growing and growing as I folded each one and remembered different times in his life. Once I’d finished, I realized I had better thin that pile down. I know I cannot hang on to everything; but still, it is so hard to let go. Knowing that someone else could use them made it easier and by the end of the afternoon, I had made that stack the smallest of the three. I was packing the last of the charity clothes into a box when I glanced over to a picture on his wall. It was Jax and his uncle. 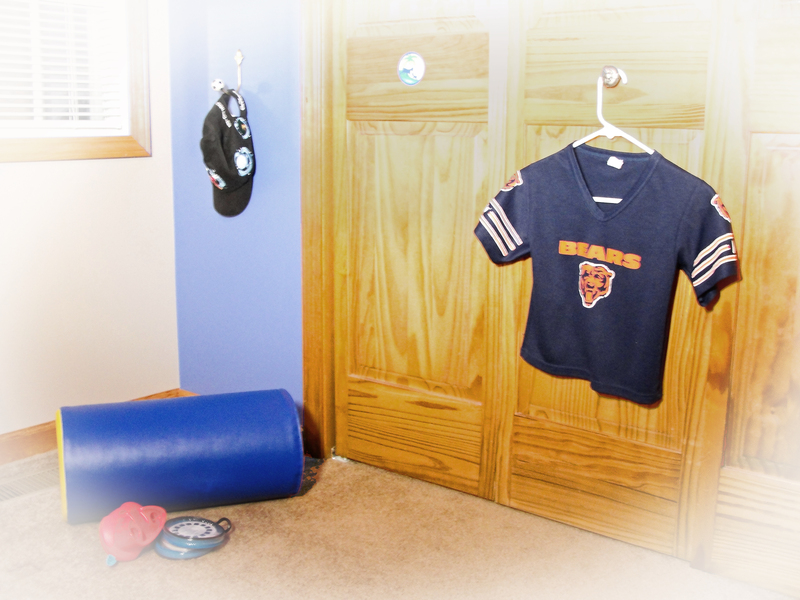 He was wearing a Chicago Bears jersey his uncle had bought for him that day. On his head was the oversized helmet he’d gotten as well. He only came up to his uncle’s knee in the photo and the shirt practically dragged on the ground. I chuckled out loud at the site of that silly helmet covering most of his head. I looked around toward the opposite end of the room and saw the helmet there in his toy basket. Very few moms can say their child has had a shirt that long…and worn it that entire time! At first, as pajamas, then as a shirt, now in a box headed to charity. Suddenly, I found myself digging through the packed clothes like a kid digging through a cereal box looking for the prize. (Not that they do that anymore.) Finally at the bottom of the heap, I found it. It still looked so fresh after all of this time. Jax looked up from what he was doing. “Mom, you can’t keep all of them.” He said. I grimaced a little; which soon smoothed out into a slight pout. Finally, I put the shirt back into the box. I picked up the box and stacked it on top of the others. I then picked up the bin of the memory clothes. “Alrighty then, go wash up!” I said and watched him race out of the room. I followed, but not without stopping to grab that shirt back out of the charity box and stuffing it into the bin. Someday I’ll learn how to quilt, I’m sure of it.